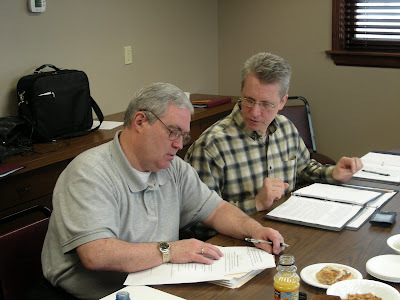 Dr. Rick Fairman (left) confers with BMH board vice-chair Dan Thornton (right) during Brethren Missionary Herald Company board meetings just concluded. In addition to caring for routine business, the board also met with Fellowship Coordinator Tom Avey and with GBIM’s Tom Julien to hear reports, updates, and perspective on the current state and future potential of the Fellowship of Grace Brethren Churches. As a result, the BMH board adopted and prioritized seven key values that will guide the company’s direction in the near-term future.